Your training package includes 10 booklets, plus a downloadable leader’s guide, and certificates of participation. 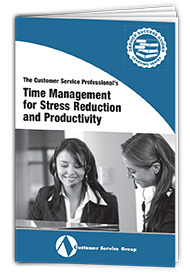 Good time management is one of the most important skills for service professionals to master. But, the pressing and often conflicting demands of customers, teammates, other departments, and management make it difficult for even the most experienced and well-organized reps to manage all of their day-to-day tasks and deadlines. 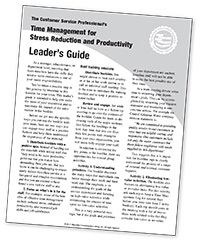 Now, you can help your staff improve their time-management skills and accomplish more each and every day with Time Management for Stress Reduction and Productivity. Your package includes 10 copies of the Training Booklet, one copy of the Leader’s Guide, and downloadable Certificates. The Training Booklets may be used on their own as a handout or you may conduct more formal training sessions with the Leader’s Guide and Certificates. 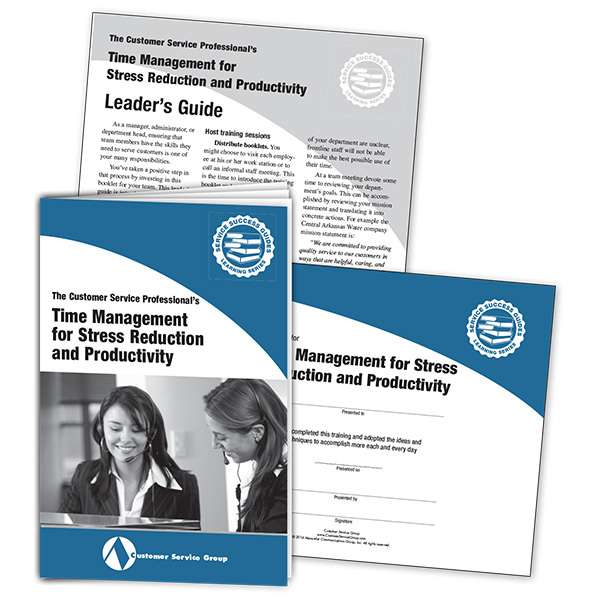 This hands-on guide includes a quiz to help reps evaluate how well they are managing their time. Plus 16 strategies to better organize their day and their work. Stand up. Intrusions into your cubicle or workspace can be handled by standing up and moving toward the “invisible door” to your workspace when someone unexpectedly enters. This will prevent the individual from making himself or herself at home. Keep it brief. Requests for information or help can often be handled by answering questions succinctly, without leaving room for additional conversation. Schedule. Sometimes you just have to say no to requests from coworkers. While saying no may feel rude or uncomfortable the answer is to say “yes” to the person and “no” to the request. It can be even more difficult to say “no” if your supervisor asks you to do something. Instead, try saying, “I’d be happy to do that, but how does it fit in with my other priorities?” Then share your schedule or to-do list with your supervisor to determine whether the request is the best use of your time. The guide focuses on eliminating low-value or no-value work. For this activity, ask each rep to keep a Time Management Log for several days before you meet (see Step 2 in the guide). Each rep should come to the meeting with a list of two or three work-related activities that they consider low-value or no-value. Note: Be sure that reps understand that you are not asking them to share their entire Time Management Log. Completing the log is an individual activity and can only be done accurately if it is done honestly and privately. Go around the room and ask each person to share his or her list. Note these tasks on a white board. Patterns should begin to emerge and your team can reach consensus on the most time-consuming of the low-value activities. Now it’s time to brainstorm. Open the floor to creative ideas and suggestions for eliminating each low-value item from the work day. For example, in one company reps were asked to collect fax numbers for each customer who called with a particular type of issue. However, the company had stopped sending faxes two years earlier. The solution was to eliminate this field on the customer data screen. At another company, reps felt they were spending too much time explaining a particular policy to callers. To address this issue, the policy was covered at the company website. This cut the number of questions by over 60 percent. The flip side of this activity is taking the time to explain the value of certain work. At a large industrial manufacturer, the service team rated sending out product literature as a low-value and low-priority activity that was often at the bottom of the to-do list. The manager explained that by doing this work, the service department relieved its sales team of up to 12 hours of administrative time per month so that they could schedule an additional two sales calls per week, which enhanced company growth. This simple exercise can help eliminate time-wasting activities, clarify priorities, enhance teamwork, and energize staff. 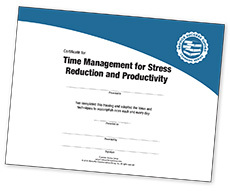 Time Management for Stress Reduction and Productivity is guaranteed. We want you and your reps to use this valuable resource and put its ideas to work in your department. Then, if you are not 100% satisfied, you may return your materials within 30 days for a full refund.